This cross combines two physically opposite but equally passionate hunting breeds, the retriever and the sighthound. As such, Whipadors are typically athletic, friendly and outgoing dogs who enjoy snuggling with their human just as much as they enjoy chasing after a small animal. This prey drive may impact the other types of pets that a Whipador should live with, which we’ll get to later. We’ll also cover the physical and temperamental differences between the Whippet and Labrador, what a Whippet mixed with Lab will typically look and act like, some possible health problems, and how to find the perfect Whipador for you. What Is a Whippet Lab Mix Dog? A Whipador is a mutt that is achieved by crossing a purebred Labrador retriever with a purebred Whippet, a Greyhound-lookalike. Though it may seem like an unlikely combination, the crossing of these two breeds actually produces a very streamlined dog that resembles a slightly heavy Whippet or a somewhat lanky Lab. The cross may also have the Whippet’s somewhat bulbous head and upright ears, longer Lab-like ears, or something in-between. Like unusual dogs? Discover the truth about the gorgeous Silver Labrador. Before we dive too deeply into the Whippet cross Labrador’s physical characteristics, though, let’s find out more about his heritage. Where Did the Whippet Lab Mix Come From? The Whippet is a sighthound breed. Sighthounds are a centuries-old group of dogs that have been developed to pursue prey using their eyes more so than their noses. The Whippet can trace its roots to Victorian-era England, where coal miners bred dogs that they could race for money, use to hunt rabbits, and afford to house … unlike the large and expensive-to-keep Greyhound. When Europeans started making their way to the newly colonized America, Whippets joined them and were continuously marveled for their speed … and they still are today. The American Kennel Club (AKC) formally added Whippets as a member of the hound group in 1888. Not to be outshined by the Whippet’s speed, the Labrador retriever is another hunting marvel. In Newfoundland, Canada circa early 1800s, small hunting dogs were bred to retrieve waterfowl. Later, these dogs were crossed with Newfoundlands, a much larger and heavier dog. This crossing created the ever-popular Labrador, which made its way to the United States. The American Kennel Club (AKC) accepted the Labrador retriever as a member of its sporting group in 1917. Today, Labradors still shine as award-winning hunting dogs, but they’re also extremely well-versed as service dogs and as household pets. With the Whippet’s “born to run” lineage and the Labrador’s heritage as a retriever, a Lab x Whippet is going to be a high-energy dog who requires plenty of play time and exercise to thrive. 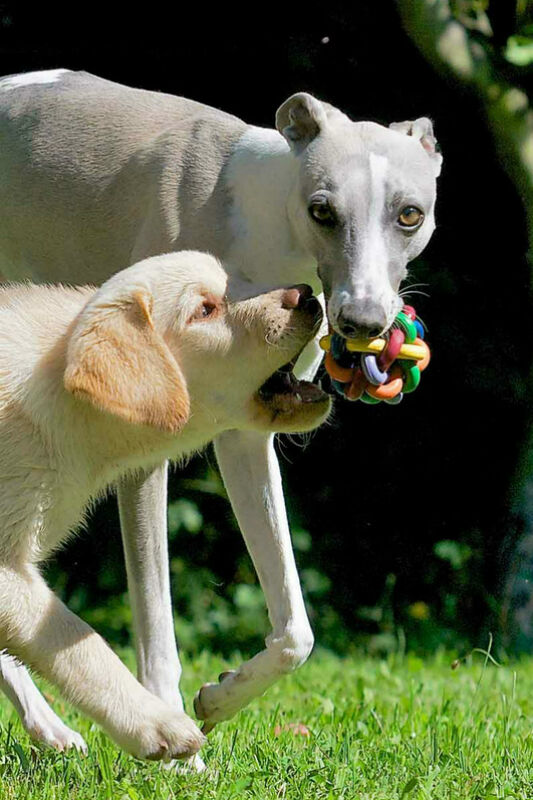 While both breeds are typically playful and friendly, the cross may inherit the Whippet’s occasional shy or anxious nature when amongst strangers or new situations. It’s hard to say with certainty how a cross will turn out because mixed breeds can be an equal mix of both parents, or they make take after one parent more so than the other. Regardless of which parent a Whipador takes after, two traits that are guaranteed to be inherited are lots of energy and a strong prey drive. Whipadors require long walks, runs and/or play time to ensure they expend pent-up energy each day. If they don’t have an outlet, then they may become anxious or depressed. 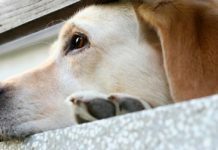 Unfortunately, an anxious or depressed dog can be quite destructive. And if a dog has a Lab’s powerful jaws, then he might be able to chew through just about anything. Sturdy dog toys (and maybe a friend, if you’re able to have more than one dog) will help to keep him entertained if he becomes bored in between walks or while he’s crated. Speaking of crating, a Whippet Labrador mix may have an issue with being left alone for extended periods of time, as Labs do not like solitude. It would be a good idea to do some crate training with a Whipador in case they will need to be put up for any amount of time during the day. Regarding prey drive, Whippets are somewhat notorious for taking off after small animals as soon as said animal catches their eye (hence their “sighthound” breeding). Similarly, Labradors can be somewhat notorious for sniffing and/or running after a small animal and not minding their leash manners as well because of this. However, if a Whipador has English Lab breeding, though, then this hunting instinct may not be as strong. Therefore, an enclosed area as well as impeccable leash training will be necessary if you want to own a Whipador. One thing that you may not have to worry about too much, though, is barking. Whippets are typically quiet dogs who only bark when necessary, and Labs typically bark if they’re excited or if they spot something interesting. With that being said, some Whippets can be overly loyal to their owners and property, so they may bark and growl at someone or something that seems threatening. Thus, it’s a good idea to socialize a Lab mixed with Whippet, preferably from a young age. On the flip side, the Labrador’s excitability when greeting new faces may cause him to jump up on guests. This can be remediated with obedience training and learning their manners. Labs and Whippets are both generally good with children, but as always, supervision during play time is recommended. Generally, a black Lab Whippet will grow to be a medium-sized, yet refined-looking dog—sort of like a Labrador without the bulk and with a Whippet’s longer legs. Based on the Lab and Whippet’s height and weight, a Whipador may reach anywhere from 18 to 24.5 inches tall at the shoulder and may weigh anywhere from 25 to 80 pounds, although it’s unlikely for a Whipador to reach a Lab’s full size. As a rule, females will be on the smaller end of the above weight and height spectrum. Depending on which parent a black Lab and Whippet mix resembles, she may look like a Labrador or more like a Whippet. Additionally, a hybrid may have blue, black, and/or white markings with or without a mask. A Lab Whippet mix may have the Labrador’s double-coat, which sheds heavily during peak shedding season, or it may have the Whippet’s short and smooth coat, which only sheds occasionally. However, if he has the Whippet’s short coat, then he may not be suited for a cold climate or for an extremely sunny climate. We’ll get into the reasons why in the next section. Mixed breeds, such as Whipadors, may inherit some or all of the health problems that afflict or are carried by their parents. 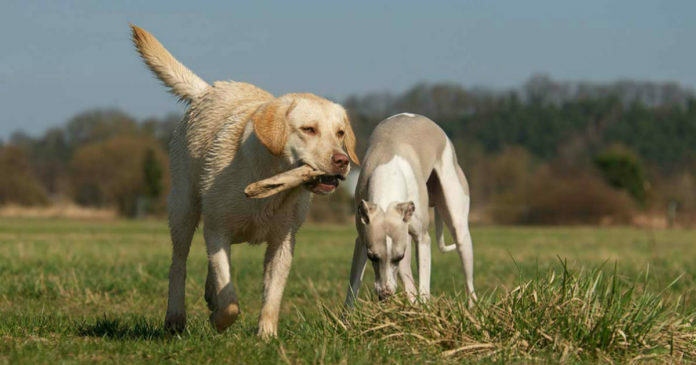 Fortunately, both Labs and Whippets are relatively healthy dogs, but as with many purebreds, their genetics and physical attributes predispose them to certain health problems. 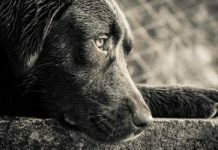 To learn more about the diseases and health conditions that Labrador retrievers are predisposed to, check out our article on Labrador retrievers. To learn more about the diseases and health conditions that Whippets are predisposed to, check out our article on Whippets. Nasal health issues—Whippets are dolichocephalic, or simply put, they have longer noses than some of their shorter-muzzled brethren. 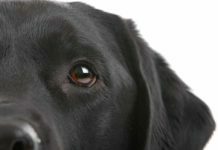 Having a longer muzzle definitely has its perks, but it sometimes can put a dog at risk of developing nasal tumors, sinus problems, and other conditions. Check out our article on Long Face Dogs to learn more. Congenital deafness—According to a 2004 study, Whippets with the piebald or extreme-white piebald gene are most likely to be born bilaterally (one-sided) or unilaterally (completely) deaf. The piebald gene is found in predominantly white dogs. Color Dilution Alopecia—Another color-related genetic condition, color dilution alopecia (unusual hair thinning or loss) has been reported in Whippets and other dogs that have a diluted hair coat color, especially blue or fawn. While it’s not particularly dangerous, it does require some special shampoo, rinse or ointment if the bald skin becomes flaky, itchy or cracked. Hemangiosarcoma—One final color-related health condition that is common in Whippets is hemangiosarcoma, or skin cancer. Whippets have naturally thin fur and light-colored skin, and so like fair-skinned and fair-haired humans, they are more susceptible to sunburn and subsequent skin damage. According to the American College of Internal Veterinary Medicine, one way to prevent a susceptible dog from developing skin cancer is to carefully monitor their exposure to extreme sun if you live in a very sunny climate. Multidrug resistance (MDR1 drug sensitivity)—According to the Banfield Pet Hospital, the multi-drug resistance-1 (MDR1) genetic mutation prevents the dog’s body from removing certain drugs from the brain and is common in sheepherding breeds. Dogs with the MDR1 mutation should not be given certain antibiotics, anti-cancer drugs, anti-diarrheal drugs, dewormers, pain medications or tranquilizers. Doing so could result in an adverse reaction due to toxin buildup, including but not limited to seizures, blindness, loss of muscle control or death. 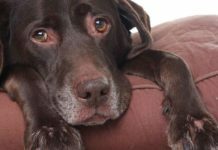 Autoimmune thyroiditis—Otherwise known as hypothyroidism, this condition is caused when there’s a lack of the thyroid hormone in your dog’s body. According to a 2010 study, sighthounds like Whippets have most commonly been observed to have low total thyroid hormone levels. A dog with hypothyroidism will need to be given a pill to replace the hormone that is not being secreted in order to prevent such symptoms as dry skin, hair loss, skin disease, weight gain and behavioral issues. “Bully” Whippet—According to a 2007 study, this is a condition that causes over-muscling in athletic breeds, like Whippets, when a genetic mutation in the myostatin gene is present. When one copy of the mutation is present, the affected dog may just appear to be very muscular and highly athletic, but when two copies of the mutation are present, the dog will appear entirely too muscular. 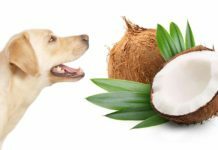 While over-muscling is not necessarily detrimental to afflicted dogs, as the condition may cause some muscle cramping, it is mostly just unsightly. Mitral valve degeneration (MTD)—This heart condition, which often leads to left-sided heart failure, is the most common form of cardiovascular disease in dogs. It typically does not present until a dog reaches older age, but in Whippets, some studies are showing an increasing number of much younger Whippets presenting with signs of cardiovascular disease. This suggests that MTD could be hereditary in certain breeds of dogs. Surgery takes place in a cold and sterilized environment. Whippets placed under anesthesia are thus at risk of developing hypothermia if their body temperature is not monitored closely and adjusted as needed during a procedure. Whippets also have an issue with their liver filtering certain drugs that are used during anesthesia, which results in increased “wake-up” and recovery time post-surgery. Therefore, certain agents cannot be used for anesthesia in Whippets and Whippet mixes. As we’ve mentioned a few times, Whippet Labrador crosses need daily exercise and play time, or they may become a royal terror to your house, not to mention become very unhappy. If you’re unable to take your dog on a couple of walks each day, then hiring a dog walker will be necessary when you’re away. Your dog will also love the opportunity to be let off its leash to stretch its legs—if you don’t have an enclosed area for this lover of running, then you might consider taking him or her to the dog park for some much-appreciated open air (and range). With all of that being said, though, a Whipador will happily lounge with you after he’s had a chance to stretch his legs. How Long Will a Whippet and Lab Mix Live? A Whipador’s life expectancy is about 10-12 years old. Before you purchase a puppy from a breeder, we recommend that you do plenty of research to ensure that you only buy from the best of the best, so to speak. Not all dog breeders are equal. Responsible breeders use genetic testing to prevent the passage of undesired traits or health conditions, while irresponsible breeders breed using stock with known health problems or genetic predispositions. Responsible breeders also keep all of their dogs healthy and in clean living conditions. Unfortunately, there are lots of breeders who run puppy mills solely to produce lots of puppies, with no concern for the health of the breeding stock. 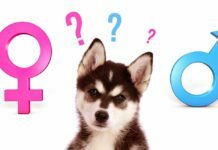 If a breeder is unwilling to show you their entire facility, if they have breeding stock or puppies that are sick, and/or if they do not use genetic testing, then you may wish to continue your puppy search elsewhere. What you pay for a Whippet Lab puppy will be based on the value of the breeding stock, the availability of puppies, and whether or not they’ve received various veterinary services (such as spaying, neutering, vaccines, etc.). Since the Whipador isn’t quite as popular of a Lab mix, you probably won’t pay as much for one as you would for a purebred dog or another more popular Lab mix, such as a Labradoodle. Not all black Lab Whippet mix dogs have to come from a breeder. Adult dogs, purebred and mutt, working dog or pet, end up in shelters or animals rescues. Some are surrendered by owners who cannot care for them anymore. Some are taken from bad situations. Some are picked up as strays. You might find yourself a perfectly nice Whipador for adoption at an animal shelter or rescue. We suggest beginning your search from a Labrador or Whippet-specific rescue association. There’s a common misconception that mutts are somehow unhealthy or are always inbred, but fortunately, these are both indeed false. Regardless of whether a dog is purebred or mixed, healthy puppies are achieved by only breeding dogs that have been genetically tested (and so they do not carry undesirable genes) andare unrelated. Responsible breeders do not participate in inbreeding or back-breeding, as this is what causes health problems in all dogs, no matter their breed. It’s imperative to know the health of the dogs that start and maintain the line, the conditions in which the parents and offspring are kept, and whether or not inbreeding is used to produce future generations. Continuing to breed dogs with known health issues always result in more dogs with health issues. For additional information, check out our article on Purebred vs. Mutts. If you’re looking for a Lab but in a slightly smaller, more streamlined package, then a Whippet Lab mix could be perfect for you. Just be sure that you have enough room (preferably fenced-in) for a Whipador—they do need space to stretch their legs and to expend some abundant energy. Good manners and some training will be important, as this dog will want to chase after small animals, what with its retrieving and sighthound lineage. Whether or not a Whipador will shed a lot is a toss-up, as Labs have a double-coat that sheds profusely seasonally, while Whippets have a thin coat that requires little maintenance. There are several health concerns with this hybrid, especially with the thin coat and Lab physique, so you’ll want to take those into consideration. Genetic testing may be able to pinpoint specific conditions that are carried by breeding stock prior to obtaining a puppy from a breeder. If this all sounds good, then we hope this article will assist you in picking out your new Whipador. We have a three year old and love her personality—she loves her family and select friends but is not trusted around children. We accept that she’s a hunter whether it’s watching for squirrels or deer. She loves shredding Spanish moss, as if to demonstrate exactly how she’d finish off a squirrel given the chance. Having sight hound in her explains her ability and desire to sit patiently in hopes of spotting her prey. And she’s fast! She must have a champion bloodline because she likes nothing more than showing off her speed with giant loop de loops, and other times thundering by, thoroughly enjoying the galloping sounds she makes. Billie is a cuddler, this is what we love most about our little girl. I’ve had our rescued Luna for 1 year now and we got her at 2 months old. Since she was 3 old I’ve taken her to the soccer field and throw the ball as hard as I can for 20 min straight. She brings it back every time, and has the freedom to run away at her will. She is good with larger dogs, smaller dogs, on leash, and off leash. She jumps on happy people, but not kids or people who ignore her. Hands Dow the best dog I’ve ever owned, and we leave her home uncrated sometimes up to 8 hours straight. The worst thing she ever did was eat a piece of mail, and chew a stick on the couch. An absolutely amazing animal for under 18 months whipit lab mix. I have had one five years and he is the joy, very sweet and very friendly. He was also very easy to train. I would love to have another one. I fostered a whipador for a month and it turned out to be a disaster. The dog had to be put down due to too high prey drive and attacking small dogs around my home. I personally wouldn’t have one.